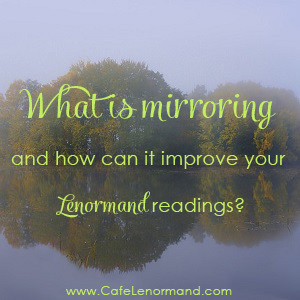 Home » Grand Tableau » What is Mirroring and how can it improve your Lenormand readings? 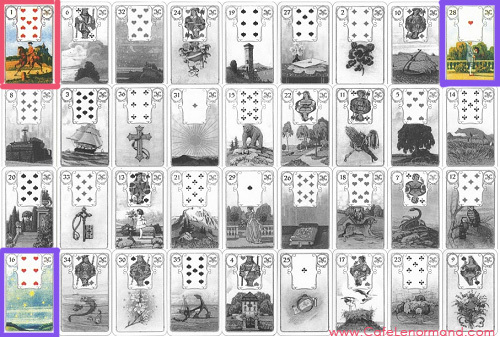 Mirroring Lenormand cards is an advanced technique that provides many of the subtle insights and details that make a Lenormand reading special. It is a card reading technique that predates the creation of the petit Lenormand deck. The earliest writings about it that I've seen are by Etteilla, in his book Etteilla, ou la seule manière de se recréer. The book explains Ettiella's method for reading playing cards using a Piquet deck, and has been the basis for the petite Etteilla deck we know today. If you know French, you can click on the link above to read Etteilla's book, including his description of mirroring. We know that Mademoiselle Lenormand studied the works of Etteilla, so it isn't surprising that his mirroring techniques work so well for all types of Lenormand spreads, whether it's a simple 3-card spread or a more complex Grand Tableau. Mirroring provides quite similar information to what you receive from card combinations. They both give you descriptions, qualities, details, and small insights. Essentially, they both help to flesh out the story, moving you from a few basic individual card meanings to a bigger picture of what is occurring. For example, if a Man mirrors the Lily, he has similar qualities or characteristics of the Lily. He's probably older, mature, or someone well-respected in his field of work. 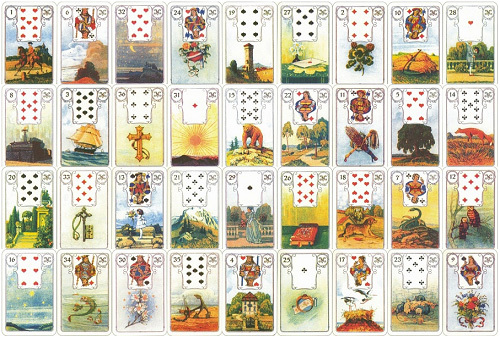 At its basis, mirroring in a Lenormand 3-card spread is the idea of forming combinations from the cards as if you had folded the spread in half. If you were to fold the spread above in half, you would see that the Book and the Birds are “mirror images” of another. Thus, you would read the Book and the Birds together as a mirrored pair of cards. The meaning could be secret conversations, skillful negotiations, or wise discussions. But the key is that mirroring is giving us more information about what the Book and the Birds mean. Mirroring works much the same way in a 5-card spread as in a 3-card spread. The difference is that you now have one more pair to mirror. When you fold the spread above in half, you see that the Tower mirrors the Star and the Key mirrors the Lily. Tower + Star could refer to a movie studio, old dreams, or strong protection, depending on the question asked. Key + Lily could indicate success that comes slowly or significant recognition. 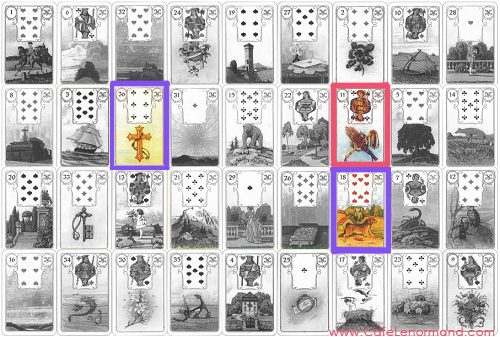 Mirroring Lenormand cards in a Grand Tableau (GT) works a little differently. You don't have to mirror every card in the spread to get the answers you're looking for. You can just pick the card that covers the topic you're interested in and read the cards that mirror it. Each card generally mirrors two other cards. Whereas in 3- and 5-card spreads, we fold the spread in half vertically to find the mirroring cards, in a Grand Tableau, we fold the spread in half vertically AND horizontally. Let's use the GT below as an example. The querent is female. Step 1: Pick a card or topic you want more information about. Let's say you want to know more about the Rider. Does it represent a message? a visitor? someone new coming into her life? Step 2: If you were to fold your GT in half vertically, which card mirrors the Rider? Step 3: If you were to fold your GT in half horizontally, which card mirrors the Rider? When you fold the GT in half vertically, you see that the Rider (in pink) mirrors the Man (in purple on the top right). This tells us that the Rider is indeed a person! Since Rider + Man typically represents a new man coming into the querent's life, often a love interest, we just found out some really interesting information. When you fold the GT in half horizontally, you see that the Rider mirrors the Stars (in purple on the bottom left). This tells us that this may be someone the querent has been hoping will come into her life. It may even be someone she meets online. How's that for some juicy gossip??? Let's try a different card in the spread – the Whip. Try it on your own first. Use the GT above and find which cards mirror the Whip. What do you think they mean? Vertically the Whip (in pink) mirrors the Cross (in purple on the left) indicating that there have been arguments filled with pain and anguish. Horizontally, the Whip mirrors the Dog (in purple on the right). The arguments have involved a friend. So here mirroring tells us that a friendship has soured. It's been a painful experience, possibly abusive. Now you see how mirroring Lenormand is an advanced technique that, although easy to do, provides more insight and details. It does need to be used ethically and with great care because mirroring can reveal secrets that people may wish to remain hidden. It doesn't happen all the time, but when you know how to read Lenormand, particularly GTs, people and the lives they lead can become an open book. I’ve just discovered lenormand in my many psychic paranormal adventures … I can’t believe how accurately scary it is… Not an easy one to read as I found there are many ways! One small favour if I may… If I post a photo of taken of my first spread could you read it a little? could you please give some more examples about mirroring the grand tableau, especially with cards that fall in the middle of the tableau.